How easy is it to be a Dolphin? Or How #TLT13 inspired me. On Saturday 19th October, I spent the day at The University of Southampton taking part in the Teaching and Learning Takeover and walked away with a lot buzzing around in my head. Perhaps the most memorable message, the one that summed up everything #TLT13 was about, was delivered by David Doherty (@dockers_hoops) in his final speech to all the attendees. The ability to change versus our readiness to change. We all know someone who fits each of the four categories in the picture above and, if we’re honest, we will sit in each space on the graph for some point in our careers, whether it’s a day, a few weeks or months: we all have times when change seems hard, scary and unnecessary. Last April I joined a new school and was hit by a mess of information, chaos and coursework issues with no time to unravel it all. Change was something I knew had to happen and could see how much there was that needed to be changed, but how to do it wasn’t as immediately clear. Undeterred by this the new head of department, the new second and myself had meetings, planned and implemented new ideas and strategies and were starting to see results before we left for the summer. I think it’s fair to say that when August rolled around we were all dolphins and were looking forward to continuing the journey of change and improvements that we had started to see. However, in an unexpected turn of events the academy faced unexpectedly disappointing GCSE results and the consequences of this were immediate, shocking and unsettling. Yet, within a few days we, once again, felt motivated and were relishing change once more. The English department was a pod of dolphins ready and willing to do whatever it took to make the right changes for our students. But after 8 weeks of change and some turbulence in the department I can see the toll being a dolphin has taken on those around me, especially my head of department. My head of department is fabulous and desperately wants the best education she can provide for every student that walks through the English Department’s doors. But when everyone else around you is flagging and needing support, can you be a dolphin on your own? During my few introspective moments today, I found myself thinking about the ideas that #TLT13 had sparked in me and the additional pressures that introducing these ideas may place on me and those I work with. I’ve thought about how I want to use some of the differentiation ideas mentioned in Chris Moyse’s presentation to start my next A Level literature units which will allow me to tailor the following lesson’s learning to the multiple starting points in my class. David Fawcett’s ideas on feedback have inspired me to set the AMA (Academically More Able) students in the school termly targets on how they can better use their feedback to improve their levels / grades. Chris Waugh has made me rethink the format of Thursday’s AMA meeting with parents. And Chris Hildrew (yes, I missed out on the Chris clean sweep on Saturday!) has gotten me thinking about what makes my lessons outstanding…oops, sorry Chris… great and how I can find that magical 1 grading again. Overall, it’s clear to see that my head was close to exploding by the time I got home. At home, I began to wonder if all the change was a good idea if it meant that a student’s teacher was burnt out and had no time to plan great lessons. And then I looked back over my notes from Saturday and some of the pictures I’d taken which led me back to the TLT hash tag and all the inspiring and enthusiastic tweets from people on Saturday and Sunday and today. Without meaning to sound too cliché, it really was a light bulb moment! I want to be a dolphin and I think that I am, most of the time. I want to see if they help the students I teach or the AMA students I monitor. But more than that I want things to get better. I want results to get better, students to become better learners and myself to become a better teacher. 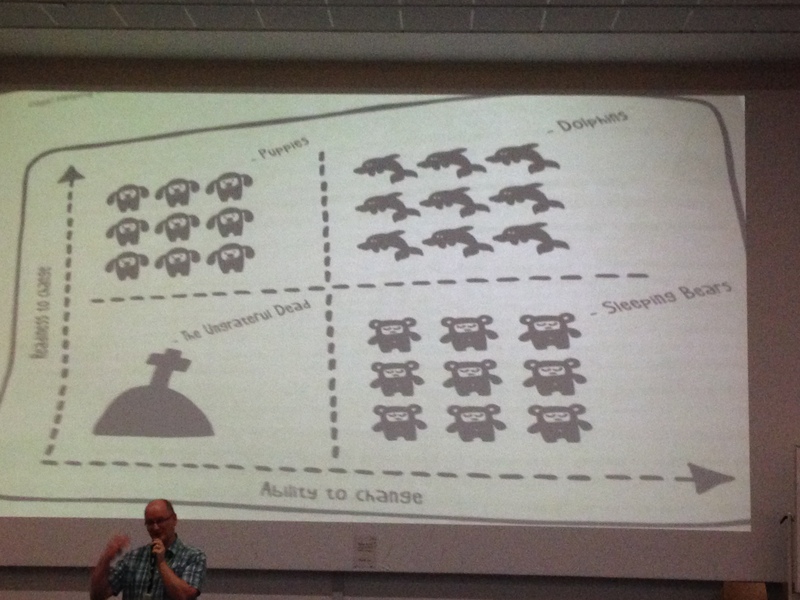 But today, I realised the most important lesson I learnt from #TLT13 is that dolphins need a pod. To be a dolphin teacher you need to surround yourself with other dolphins. You need to ask them for help, you need to be inspired by them and you need to come together and share, motivate and laugh together. Of course our classes need our time: they need us to be refreshed, energised and teaching well planned and well thought out lessons. 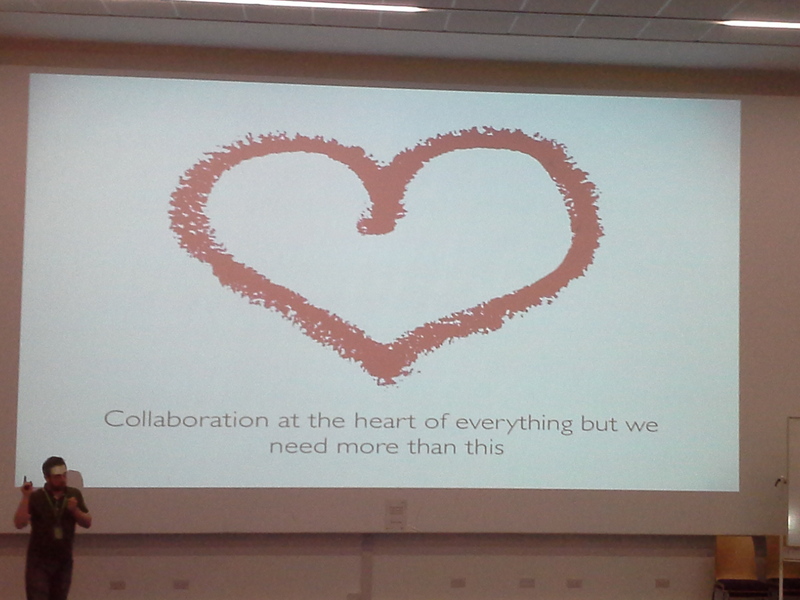 But, to the same degree, they need us to go to TeachMeets and #TLT13. They need us to be collaborating and finding out new ideas and strategies. They need us to put these wonderful new ideas taken from amazing teacher at events like this one in to our schools. Overall, the most important thing I’ve taken away from #TLT13 is my determination to be a dolphin and that I want and need to put all my #TLT13 ideas into practice, but they don’t all have to be up and running tomorrow. I’d rather they were well thought out and planned, while I delivered the great lessons I thought about with Chris Hildrew. But the only way I’m going to do this is by finding my pod of dolphins. I need to reach out more to all the fabulous Tweachers I’ve found during my time on Twitter and to make much better use of the amazing people I work with, or am about to work with. Thank you Jen & David for helping me find inspiration during your wonderful event, but most importantly thank you for helping me find perspective on it all.